Preheat oven to 350°F. Line a 9-inch square baking pan with parchment paper. 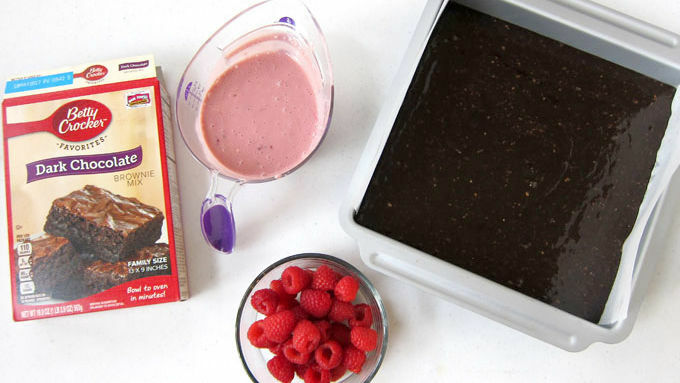 BROWNIE LAYER: Combine brownie mix, eggs, water, and oil in a mixing bowl. Stir just until combined. Fold in the zucchini. Reserve 1/4 cup of the batter, pour the rest into the prepared pan. RASPBERRY CHEESECAKE LAYER: Beat cream cheese and sugar, using an electric mixer set on medium high speed, until light and fluffy. Beat in egg and raspberry preserves. Add a few drops of pink food coloring, if desired. Smash about 10 raspberries and fold into the cheesecake filling. Pour evenly over the brownie batter. Spoon dollops of the reserved brownie batter over top of the cheesecake filling then use a knife to swirl the two together. 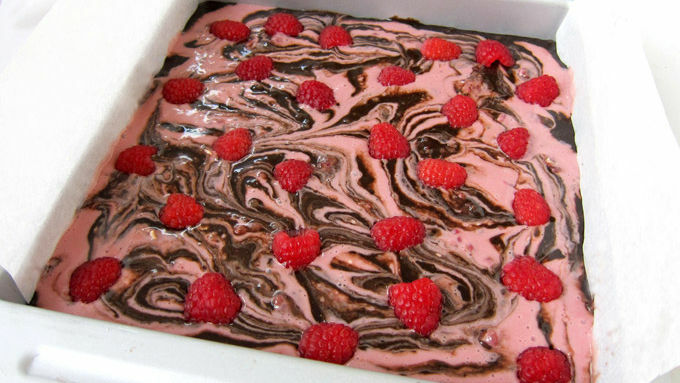 Sprinkle the remaining raspberries over top of the batter. Bake for 32-38 minutes until the cheesecake layer is set. Cool at room temperature then refrigerate for at least 2 hours. Remove and cut into 16 squares. You can peel your zucchini if you prefer not to have green flecks show throughout the brownies. Here’s a clever way to sneak a vegetable into a decadent dessert. 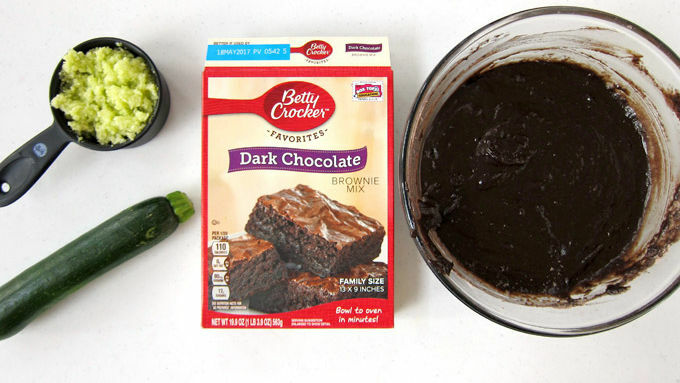 Zucchini is the secret ingredient in these incredibly moist, rich dark chocolate brownies. This quick and easy dessert is perfect to make during harvest season, when you have an abundance of zucchini growing in your garden. 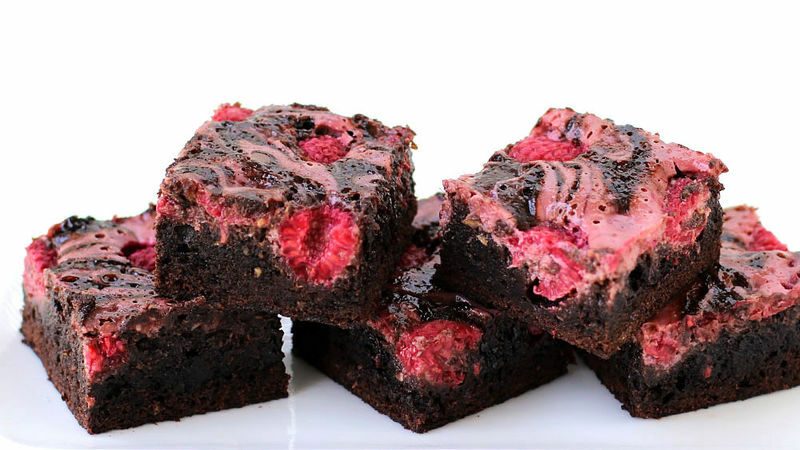 To boost the flavor of this sweet treat, the brownie is topped with a swirl of raspberry cheesecake and dotted with fresh raspberries. It’s up to you exactly how you want to prepare the zucchini. You can finely chop it using a knife or a food processor or you can shred it. If you don’t mind seeing green bits of zucchini, leave the peel on. If you want to really hide the veggie, then peel it. You can even puree it so it’s really smooth, to really conceal it. You can eat these straight out of the refrigerator or allow them to warm up just a bit at room temperature. That will enhance the chocolate flavor and allow the cheesecake layer to soften a bit.